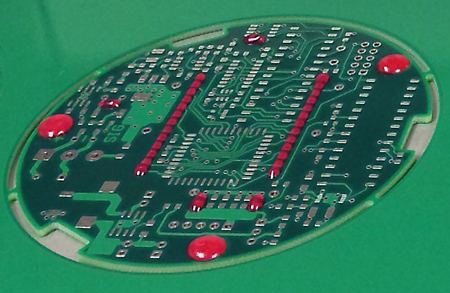 Temporary masking materials are used to protect components or areas of a PCB during a wave solder process. They are also used during conformal coating applications. The solder mask covers locations on a substrate where solder or coating is undesirable. Mask may be applied manually via a squeeze bottle or a simple hand-held syringe. This can be a tedious job and lends itself to automation. Before automating, consider the different types of mask to ensure your selection is compatible with your choice of dispensing pump. For example, pump requirements may specify solder mask use latex or be latex-free. Solder mask dispensed by time pressure. Peelable mask is a common type of mask and is typically air or heat cure. At the end of the production process, it is removed by hand. If the mask is latex based, it is best dispensed by time pressure (syringe). Latex masks tend to clump when exposed to shear stress (impacts) found in other pumps. If you want to dispense a peelable mask with high accuracy, then a non-ammoniated mask is preferred. Couple the Time Pressure and the Real Time Process Control System (FPC) for uniform dispensing over the full fluid content of a syringe. Washable mask requires a water cleaning process to remove the mask. Washable mask is easily dispensed with our Volumetric PCD Pump Series or our NCM5000 Jetting Pump for accurate and precise fluid placement. Solder Mask dispensed by Volumetric PCD Pump. Washable Solder Mask dispensed with Jetting Pump - video. With the PCD pump, large areas can be dispensed in a fraction of the time required by other methods. Fluid can be presented to the pump with standard hardware in reservoirs between 10 cc and 70 cc. Bulk feed configurations of the PCD Series are available. Island Series Dispenser: Bulk feed with Volumetric PCD Pump. The NCM5000 jetting pump offers precise placement of small droplets of fluid. With the added benefit of dispensing from 4 mm above the surface, non-flat boards are not an issue. The pump is compatible with syringes up to 70 cc. Our full range of automated dispense systems are well suited to masking applications. Auto Vision can be used to align products or locate a device to be encapsulated. Auto calibration and purging help keep the nozzle aligned and clear of blockages for maintenance-free operation. All of our benchtop systems are ideally suited for masking applications. Solder Mask dispensed with Time Pressure & Real Time Control - video. Solder Mask dispensed with Volumetric Pump - video.